In whatever weather, Rosslyn's a great place to take a walk. You can walk around the celebrated Iwo Jima Memorial, enjoy the spectacular view of Washington about the Netherlands Carillon, and stroll for miles on the sacred ground of Rosslyn's Arlington National Cemetery. Less well-known are the charms of downtown Rosslyn. 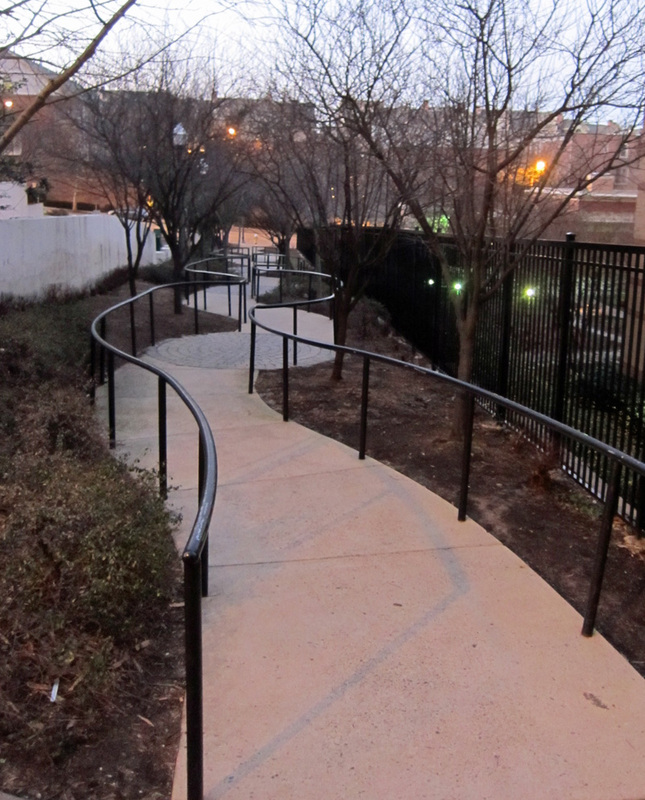 Have you ever walked down the lovely, twisty walkway between 18th St. and Key Blvd (near the corner of 18th and Oak St.)? Don't delay; do it today. As an added bonus, you'll find some public art and historic architecture on the Key Blvd side. Stay tuned for a follow-up story on the Ode Street Tribune. 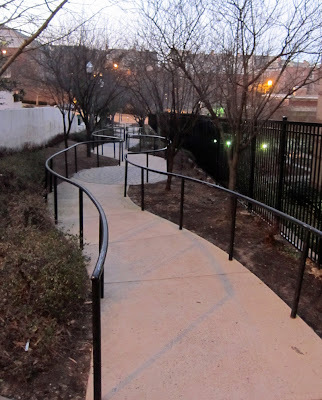 Walking in Rosslyn can no doubt be a wonderful experience. Your readers might be interested in knowing that there are three 5K American Volkssport Association sanctioned walks in Arlington. The first loop explores the commercial/governmental neighborhoods of Court House and Rosslyn, and includes a visit to the Marine Corps Memorial (aka Iwo Jima Memorial) and the Netherlands Carillon, with a view overlooking Washington, DC. From the Netherlands Carillon, a loop is almost entirely in Arlington National Cemetery, passing the Visitors Center, the Womens Memorial, the Kennedy graves, the Amplitheater (site of the presidential Veterans Day ceremonies and the Tomb of the Unknown Soldier) and Arlington House, built by the grandson of Martha Washington and home of Robert E. Lee. Dogs are not allowed in Arlington Cemetery and there are steps (mostly down) on the trail, so wheelchairs will probably find this loop impossible and strollers difficult. The last loop explores the residential neighborhoods of Clarendon and Lyon Village, then returns through the commercial area of Virginia Square and Clarendon, known for its restaurants.